There is a lot packed into this image of a town by a river, composed of three main elements. 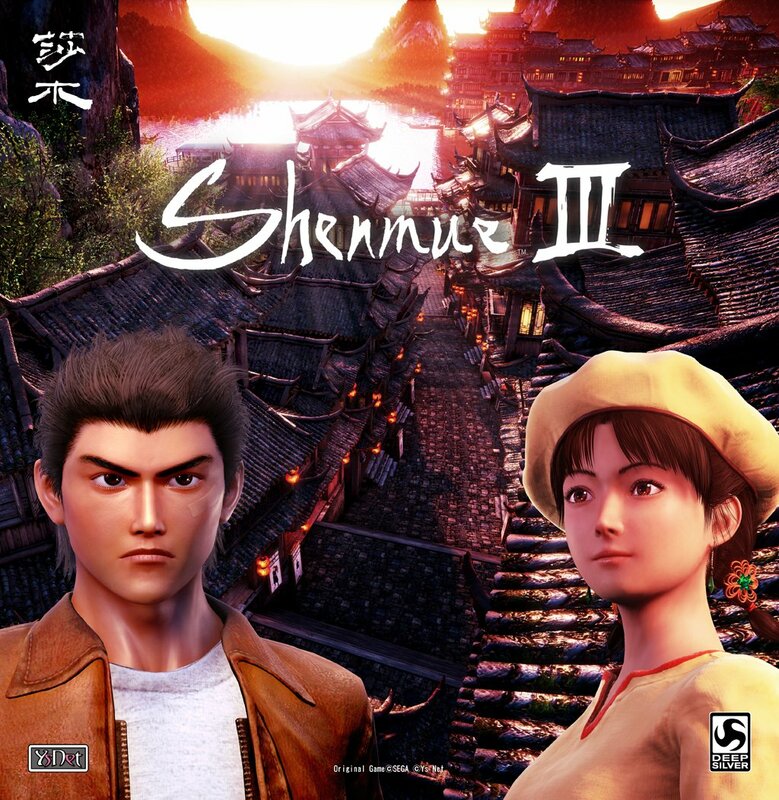 The white Shenmue III logo on the image (with an accompanying version in kanji at the top left) is a new design that hasn't been presented before. Its has distinctive irregular strokes, and the letters are separated from each other. When I first saw this logo, I was a little disconcerted at the uneven style of writing, but it has grown on me. It has character to it and I think it could serve as a viable option. 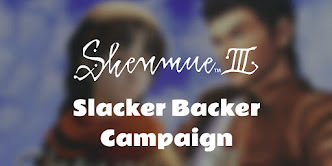 However, the appearance of a new logo is quite unexpected, since the end-of-June update contained an announcement that in consideration of backer feedback the logo would retain the style of the first two games, as below. The Shenmue III logo that was revealed in the end-of-June update. 1) The new logo found on the press release was selected following the June announcement and overrides it. 2) The logo and artwork used were created prior to June's logo decision, and so the logo found in the press releases is out of date. It is instructive to note that the end-of-June logo is still what is being used on the YS Net website - although of course this is not definitive proof (and one might ask why the press release material was not updated with the correct logo). Either way, I think we will receive an answer to this puzzle at Gamescom. 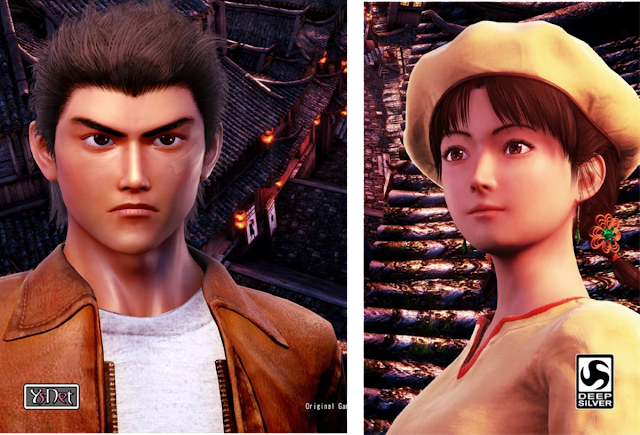 After many months of anticipation, what a surprise it was to see new character models of Ryo and Shenhua tucked without fanfare inside the press release! The appearance of the new models has really divided opinions on the fan sites and discussion boards in the community, to say the least. The Ryo character model: the wait was well worth it. After months of anticipation, for me, this is really "Ryo". Sure, there is scope for some minor tweaks here and there, but there is plenty of time for that. 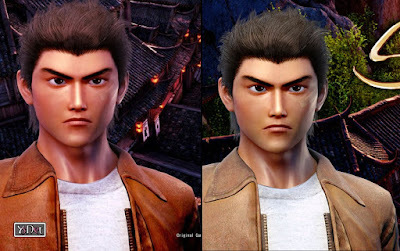 The Shenhua character model: I have to admit that I was skeptical at first with this one - it didn't resemble the Shenhua I had come to know in the second Shenmue game. But as I have taken the time to reexamine my expectations, I've begun to appreciate the potential in this model. There is a change in "look" for Shenhua, but I sense this may be a deliberate artistic decision. I am going to keep an open mind as the goal here may not be to just duplicate the model from the original releases. Of course, since both models are work-in-progress, there are bound to be further changes and improvements until release. I can't wait to see these characters animated and situated in a proper environment, hopefully in the coming days at Gamescom. I think seeing the characters in motion and hearing them speak will be the true test of authenticity for the models in their latest state. The scene depicted is truly stunning. An evening scene of a riverside town showing distinctive tiled rooves, illuminated windows and red lanterns glowing. A cobbled street runs down between the buildings to a river, where a ferry can be seen waiting at the wharf; tall mountains rise in the distance. The amount of detail is incredible: the individual moss-covered tiles, the texture on the cobble stones, the intricate warren of buildings with lights at the windows and red lanterns hanging, the entire scene lit up by the rays of the evening sun that reflects off the water and casts shadows on the streets. The nature of the location matches with what we know about the town of Choubu, one of the three main areas that Ryo will be exploring. It appears to be closely based on the picturesque ancient town of Fenghuang (or one like it), which Yu Suzuki displayed during his Shenmue 3 talk that he held in China in November of 2015. 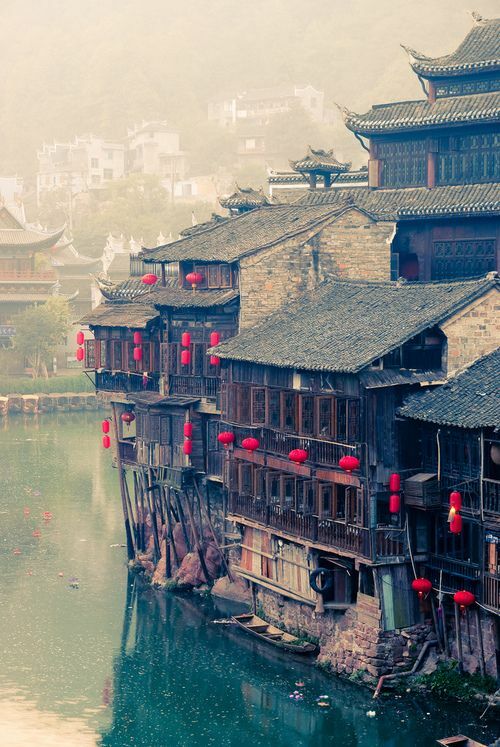 The ancient riverside town of Fenghuang. The thought that we will actually be able to explore a town like this takes the breath away. I am intrigued as to the purpose of the sign boards that stand on the street outside the building entrances. A close examination of them reveals what looks like character illustrations on them. Whether they are placeholders during development, or will perhaps have some meaning within the actual game, remains to be seen. Boards at the building entrances: to what purpose? 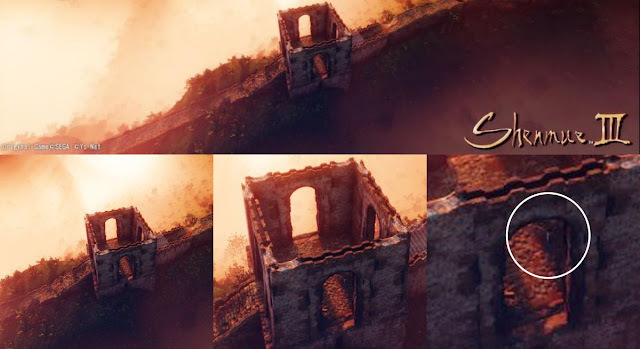 The second image from the press release shows a great fortified wall running into the distance along a mountain ridge, with a setting sun bathing the mountainside in a red glow. It can be seen that parts of the wall are in a bad state of repair, being uneven and dilapidated. 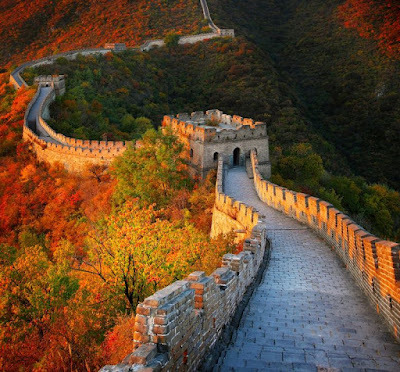 Given the obvious similarity, it would seem a fair guess that this fortified wall is part of the Great Wall of China. A second version of the riverside town image exists in banner format on the Deep Silver site. Image from the Deep Silver press release (click to enlarge). Apart from the wider view of the rooftops, it also contains a number of minor but interesting differences compared to the one on the YS Net site. 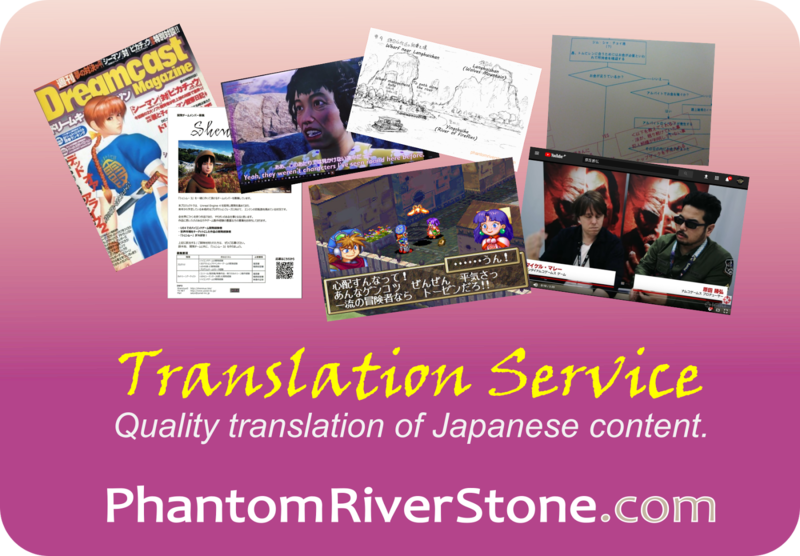 Logo coloring (also the Deep Silver image has no kanji logo). Lighting / shading differences: for example, sun rays are visible in the YS Net version. 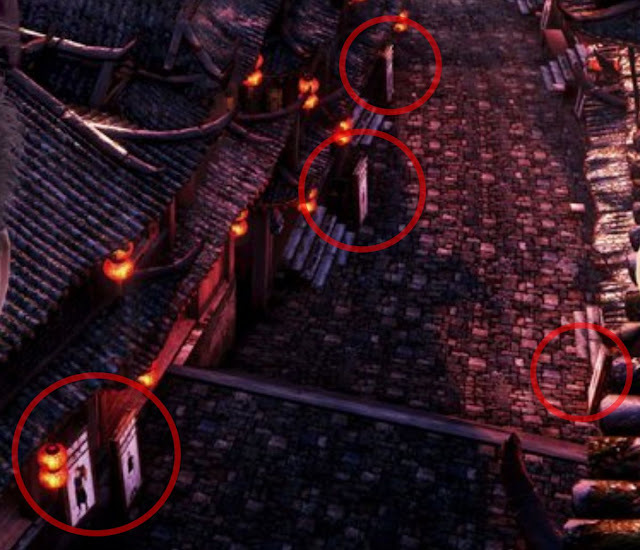 (1) The Deep Silver version has what appear to be wooden poles - clothes poles for hanging washing, perhaps? - spanning the street in places, between some of the houses which are not present in the YS Net version. (2) The YS Net version has steps off the street leading to the buildings. (3) The paving detail of the street differs between versions. YS version (left): steps lead to the buildings. Deep Silver version (right): wooden poles span the street & the street paving detail differs. The coloring on Ryo and his jacket. There are numerous other small differences including the presence of small boats on the river and additional lighting in the windows (both for the YS Net version). In general, the YS Net version of the scene appears to have several enhancements compared to the Deep Silver version of the scene, and thus probably represents a version of the scene that was created more recently after additional development. 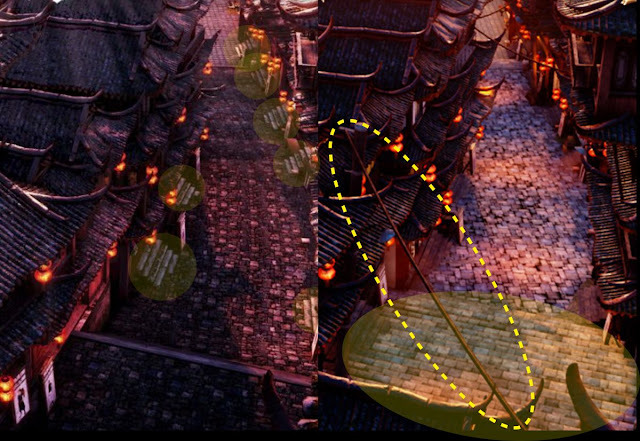 Finally, an amazing discovery has been made in the "Great Wall" image. 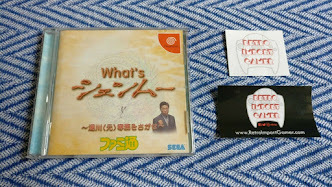 Spaghetti posted on the Shenmue Dojo the remarkable finding that Ryo himself is actually present in the image, standing inside the walled structure. He can only be seen properly after zooming in super-close, but once you peer closely enough there is no doubt that the little figure is him - see below! Assuming that his character is scaled appropriately with respect to his surroundings, the immensity of the wall structure becomes apparent. As per his tweet earlier today, Yu Suzuki is now on a flight over to Germany for the Gamescom event. A very exciting week lies ahead for Shenmue 3. Honestly - its an in depth look at this, but you are blinded by dedication to this game. That font is a joke, the bad photoshop is a joke, and the models still need work. It doesn't mean I am not excited for this game. The images themselves look really cool and I can'twait to see more next week. Heh, well I have tried to give a considered appraisal - and in particular for this case, taking into account that these are work-in-progress images in the context of a press release. Roll on Gamescom! We should get clarity on at least whether there has been a change the logo, in the next few days. I will jump in and offer my 2 cents as well. 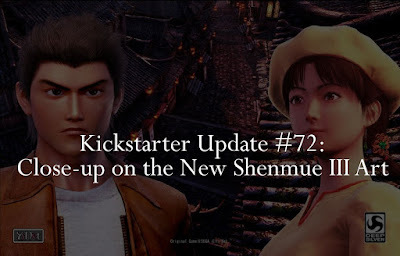 Personally, as an artist, I also find that the new font lacks professionalism even if they are wanting to offer a distinctive style for Ryo's epic journey through China it looks silly to me. I won't even bother commenting on those models until we see more details during this upcoming Gamescom. For what it is worth, I will continue to wish this project all the best which I am holding close to my heart. It is interesting to hear your take as an artist - my opinion on this new logo design is purely as an amateur! Looking forward to what you think of the progress with the models after the latest footage is revealed at Gamescom.